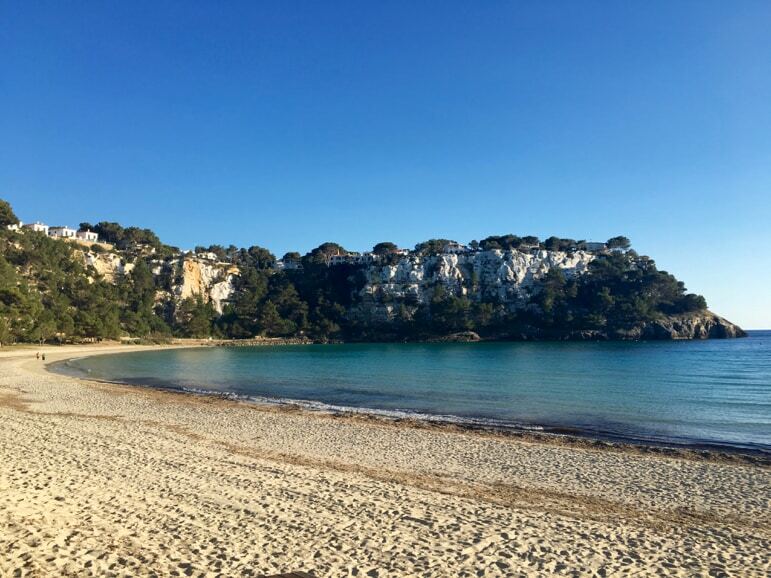 After my visits to the beautiful island of Menorca I felt I just had to compile this list of the best Menorca beaches – the ones that every visitor to the island should sink their toes into. Many people, especially British travellers, take holidays to Menorca to enjoy its beaches among other attractions. But as I visited the island to research it, I discovered far more than a simple list could ever do justice to. Menorca’s coast has a story I felt compelled to share and beaches I felt duty bound to write about. 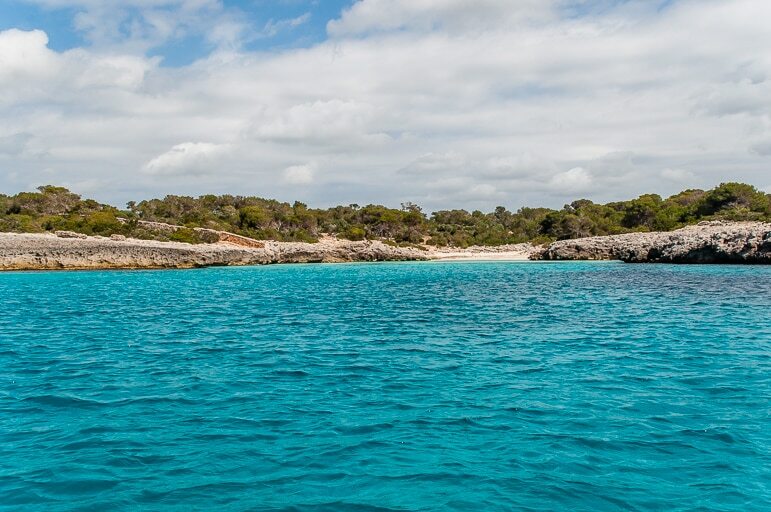 Not only are the best Menorca beaches beautiful, when you compare them to other popular destinations in Spain and popular beach destinations in Europe, they are little known and under-explored. It is an island with tens of virgin beaches just begging to be discovered. And the reason for this is their secret past. As we approached our third deserted beach of the day on a coastal tour with Menorca En Barco, the aquamarine water lured me in like bait on a hook. 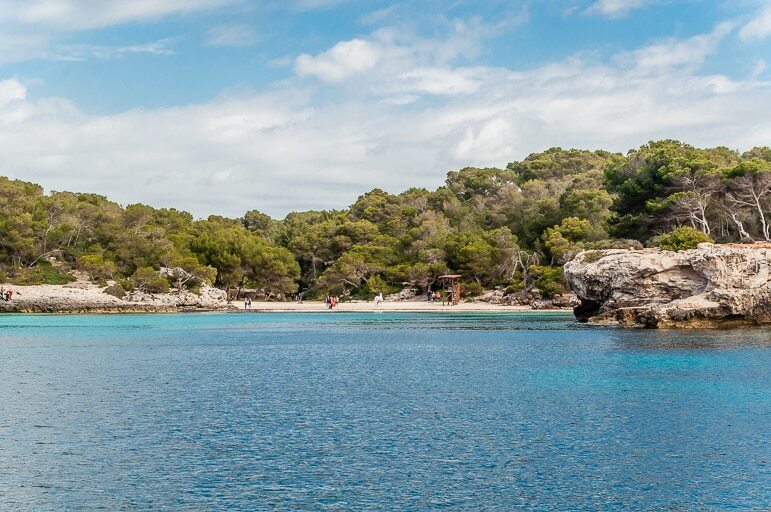 Let’s start with a couple of fast facts – there are more than 130 Menorca beaches. That is more beaches than the island’s larger Balearic neighbours of Majorca and Ibiza put together. And like the golden sands that shift under your feet, beaches in Menorca have a long past. 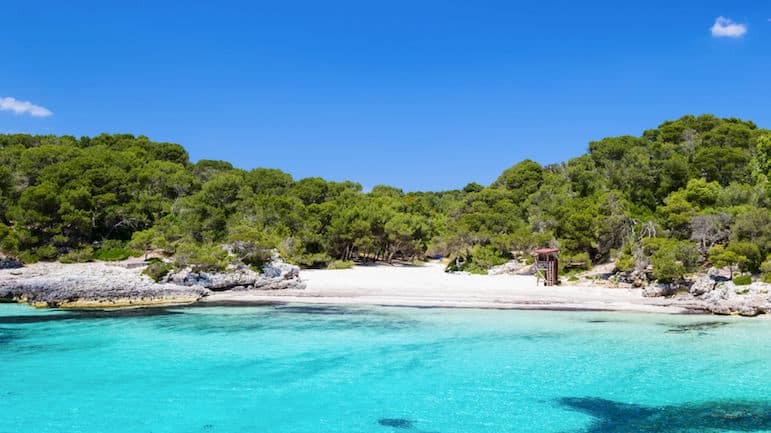 The best beaches in Menorca have been hidden away from tourist masses by a combination of history, the island’s slow adoption of tourism and inaccessibility. The island’s beaches are clean and well conserved, in part because of an uncomfortable period in Spain’s past. Menorca was the final outpost to fall to Franco’s iron rule after he came to power in Spain in the 1930s. Islanders resisted his government and went their own way for some years. To punish them, Franco implemented a number of sanctions on the island. One of these was that when the tourism industry began in Spain in the 1960s he invested money in Majorca and Ibiza but starved Menorca of investment, stopping it from pushing ahead with tourism projects. For this reason, tourism only took off in Menorca in the 1980s, by which time the world was more aware of the impact of tourism on the environment. Menorca’s planners were more concerned with sustainable development – it’s the reason why there are few high-rise developments on Menorca. And it’s one of the reasons why Menorca’s beaches are so well-preserved. You will find many of the Mediterranean’s best resorts in Menorca. Another aspect that has maintained Menorca’s coastal good looks is that many of the best beaches are only accessible from walking routes, such as the Cami de Cavall. Some of these may be just 250m from a car park, others can only be reached by the beach path that takes walkers from bay to bay, or via the Camino de Caballos, a horse-riding trail that encircles the island. For those that like to hike the coast offers up some of the best walks in Menorca. But don’t think for a moment that these beaches are out of your reach – Menorci’s spend a lot of time on the beach, and you should too. With secluded crystalline bays and a host of caves, it’s well worth just a little extra effort to explore Menorca’s coast. Menorca’s beaches vary depending on whether you’re in the north or south of the island. Northern ones are generally larger with panoramic views and coarser sand of varying colours. They can be more exposed to wind and waves on less calm days. Southern beaches have fine white sand and are backed by pine-forested cliffs. I can’t promise you’ll have these beaches to yourself in the summer, but you should still find plenty to enjoy there. This large horseshoe-shaped bay is surrounded by cliffs and has shallow warm waters and excellent snorkelling. It’s a good area for families or those looking for a peaceful, quieter resort, yet still with very good facilities. Macarella is the larger of the two beaches here, and the busiest in the summer months. It has a beach restaurant, plus shower and toilet facilities. 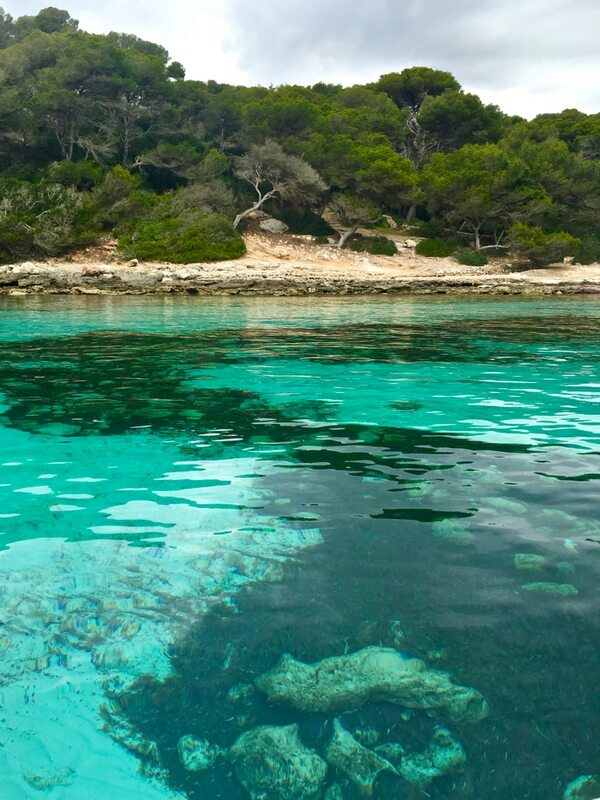 Both Macarella and Macarelleta are idyllic coves with fine, white sand and turquoise water lapping at the shore. They are among the best for swimming and snorkelling in Menorca. 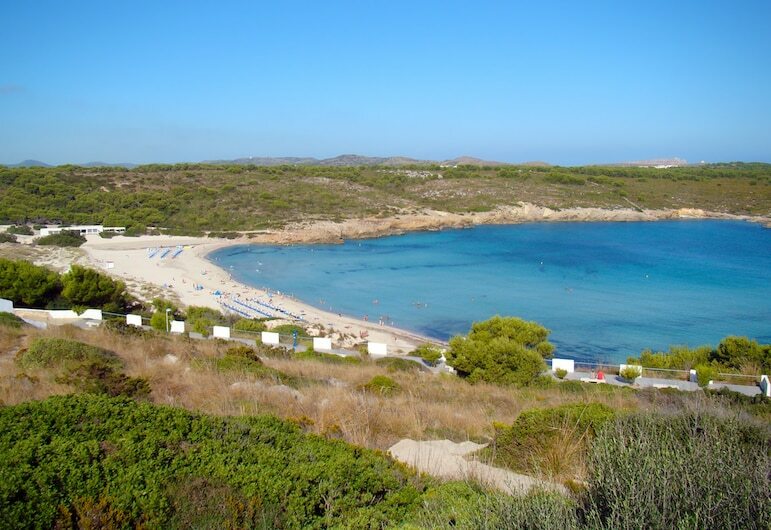 Macarelleta is a short walk away via a coastal path and is also one of the most popular Menorca nudist beaches. Located on the southwest coast this beautiful beach is a 20-minute walk from the nearest car park and is at its best early in the morning or late in the evening when there are fewer people there. Other than toilets there are no facilities here, so don’t forget to bring food, drink towels etc. 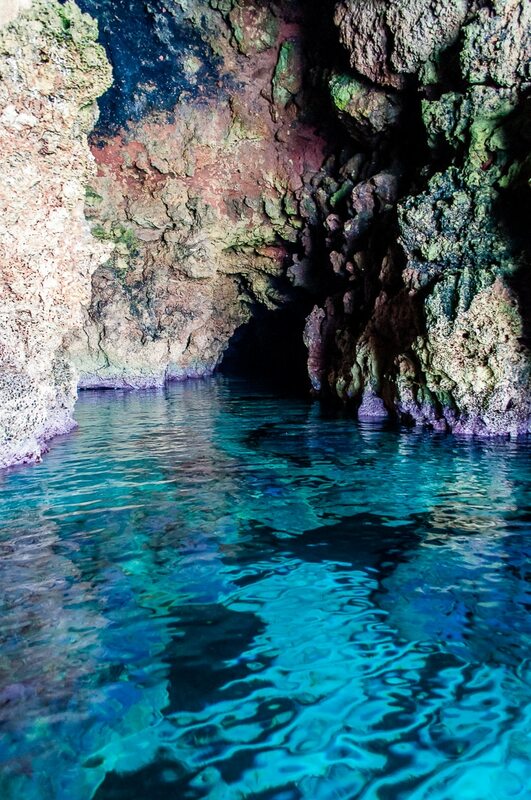 Cala Mitjana was one of the first of Menorca’s virgin beaches to be made accessible by car and has two water caves. It is a three-minute drive from Cala Galdana. 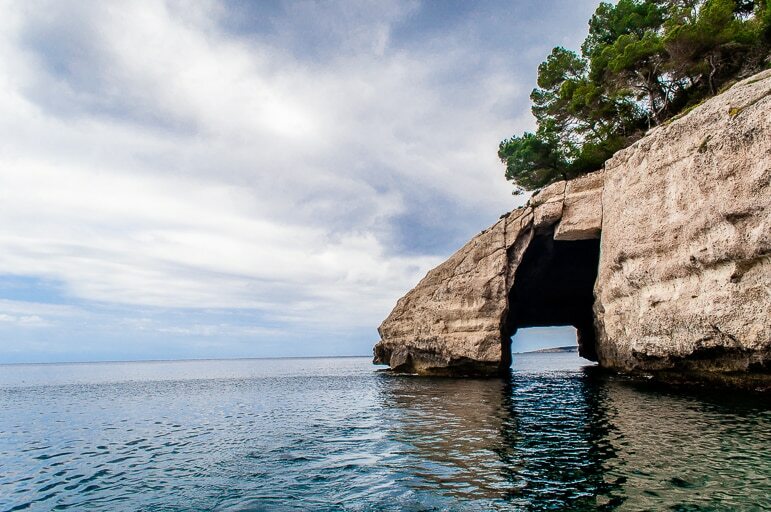 It has two sea caves – a smaller one close to the beach with another small beach inside, plus a much larger cave, which makes it a very popular place for snorkelling in Menorca. It is a beach that is both popular with local people as well as tourists. 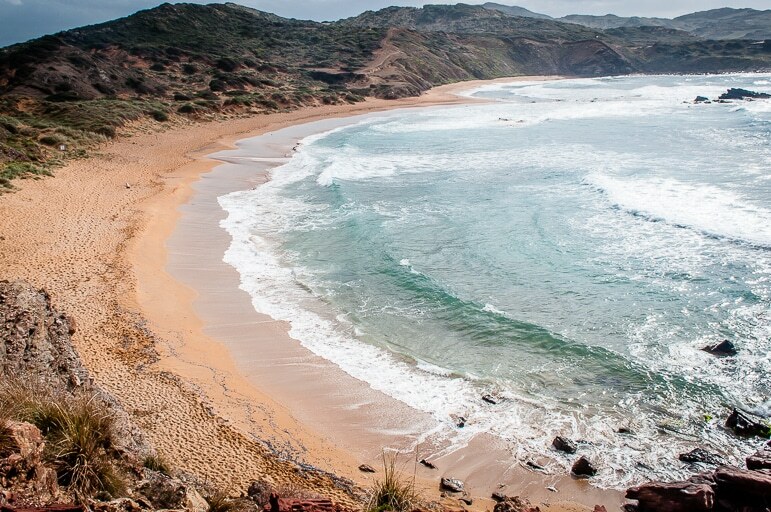 A double heart-shaped bay in the north of the island, Cavalleria is an unspoilt red-sand beach, about 15 minutes walk from the car park – but it’s well worth the stroll. Note that Cavalleria beach has no facilities so bring food, drink and everything you require with you. It is just a few kilometres away from the Cap de Cavalleria lighthouse if you fancy a change of scenery. Pregonda is a long golden sandy beach on the northern coast of the island. Much of this part of the coast is a marine reserve. Do be aware that from the car park to the beach it is a good hike. However, its regarded as one of the best walks in Menorca and so it is well worth the effort. There are no facilities on Pregonda beach, so be sure to bring all that you might need. 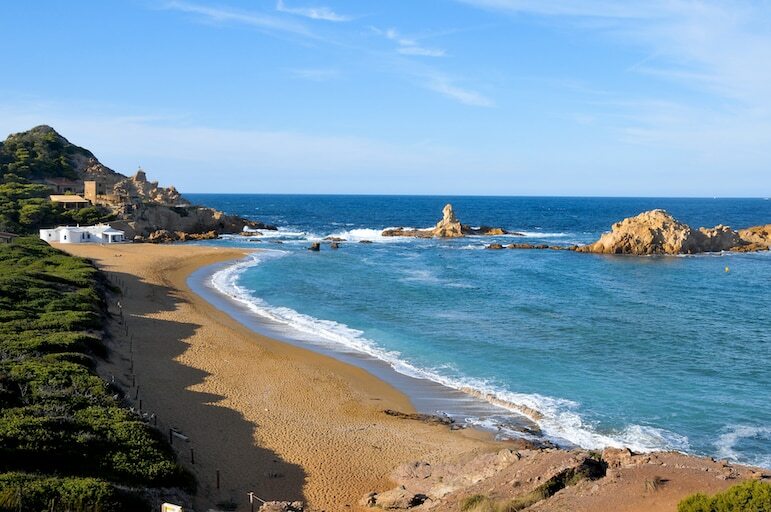 Located in the southwest of Menorca are the two sandy beaches of Son Saura, Banyul and Bellavista. Both are very popular with locals and a rocky point separates them. Thankfully, neither gets too busy and usually, they have a fairly relaxed feel about them. There is a car park approximately 10 minutes away on foot. Cala en Porter beach is regarded as child-friendly in as much as it has gently sloping shallows, clear water and is a beautiful sandy beach. 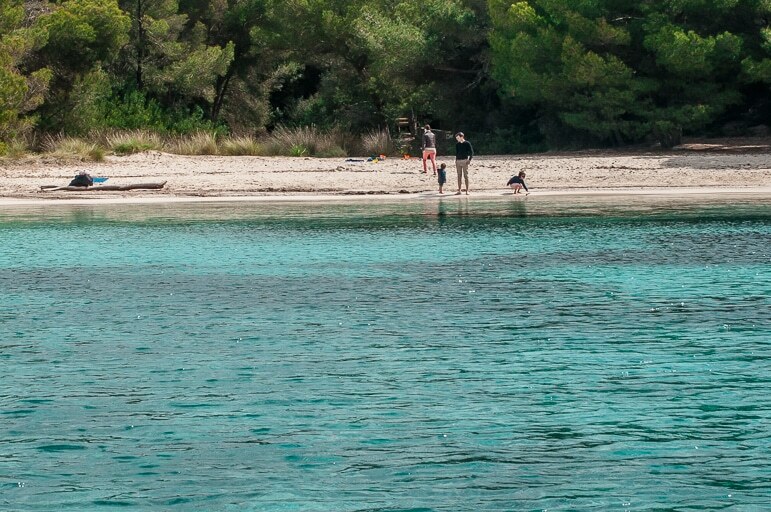 Widely viewed as one of the best beaches on the island it also has some of the finest snorkelling in Menorca. Cala en Porter is well equipped with a range of facilities including car parking, toilets, showers, a lifeguard, some café bars and restaurants. There are many Menorca nudist beaches where like-minded naturists can sunbathe au natural for an all over tan. Head to Playa de Son Bou, Binigaus Beach, Mitjanetta Beach, Cala Trebaluger, Cala Macarelleta, Cala d’Algariens, Cala Mesquida or Cala del Pilar. Heading off on holiday to Menorca? You have an array of airports for flights departing from all corners of the UK. Flights are into Menorca Airport (MAH), just five kilometres from the capital city of Mahon. You can find direct flights from the following UK airports, taking around two hours to travel to the island: London, Glasgow, Birmingham, Bristol, Doncaster, Edinburgh, Leeds, Manchester, Newcastle, Norwich and Nottingham. Indirect flights go from the following UK airports: Birmingham, Cardiff, Southampton, Jersey and Newquay. Artiem Audax – a four-star hotel just across the road from Cala Galdana and has a spa with a thermal circuit and outdoor pool. Artiem Carlos III – in Es Castell this four-star is well placed for exploring the island by road and by boat.